An Invitation To Disappear is the debut LP by British electronic musician Inland aka Ed Davenport – and his first release for A-TON. 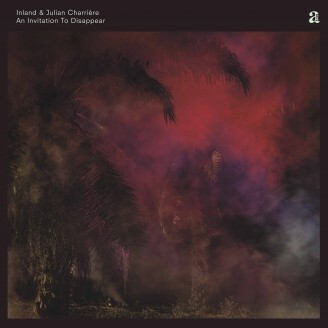 Based on his soundtrack for a video installation by conceptual artist Julian Charrière, Davenport has recast the material and field recordings into eight tracks of rhythmically intricate electronics and spectral, ambient techno, inspired by Charrière’s visually striking, 76-minute tracking shot through a palm plantation toward a totemic soundsystem on full blast. Both the album and original soundtrack were created in response to the 200th anniversary of the eruption of Indonesia’s Tambora volcano in 1815, which plunged the world into darkness and caused a series of extreme weather conditions. At the time, the natural climate change crisis resulted in numerous global famines and is known throughout the northern hemisphere as “The Year Without Summer”, with global communities forced to adapt to sudden radical changes in temperature and weather. An Invitation To Disappear offers a contemporary parallel, leading viewers – and listeners – down a seemingly endless direct path of gridded palms from dawn to dusk; a bio-commercial monoculture where ancient jungle once flourished. Light flickers between rows of fruit-laden trees and a distant fire burns in the undergrowth where the border between natural image and computer simulation breaks down. At the same time, formerly incoherent rumblings of sub-frequencies begin to transform into the contours of rhythm. This is reflected sonically in eight perspectives on the lush, synthetic jungle, made of myriad buzzing fauna, morphing melody and colossal bassweight. All paths lead toward an apocalyptic dancefloor, though speeds vary widely; rhythms dissolve from straight to broken, synth tempos operate by their own internal clocks (and logic). Juxtaposing industrial agriculture with rave culture, the album explores the industrialization and refinement of nature, and the new strange forms emerging from the synthetic grids of both. As Inland, Davenport has previously contributed soundtracks to other installations by the Swiss-born Charrière, whose artistic practice focuses on bridging environmental science and cultural history, often taking place in remote geophysical locations, including ice fields, volcanos and radioactive sites. Julian Charrière is a French-Swiss artist based in Berlin. A former student of Olafur Eliasson at the Institut für Raumexperimente, Charrière’s art explores post-romantic constructions of nature, staging tensions between deep or geological timescales and those relating to mankind. His work has previously been shown across the globe, including at the main exhibition of the Venice Biennale in 2017, a solo show at Kunsthalle Mainz this past Spring and an upcoming solo show at the Berlinische Galerie opening September 26. Inland (real name Ed Davenport) is a British producer, DJ and founder of Counterchange Records based in Berlin. Known for his detailed and explorative house and techno releases on his own label, Infrastructure, Naïf and more, Davenport has recently gravitated toward the contemporary art world, finding inspiration in the cross-pollination between Berlin's art and music scenes. Previous sound design collaborations with Charrière have been exhibited in institutions such as the Musée des Beaux-Arts de Lausanne in 2014 and Thyssen- Bornemisza Contemporary in Vienna in 2017. The gallery version of An Invitation To Disappear premiered this past April at the Kunsthalle Mainz and will be on display at the Berlinische Galerie as part of Charrière’s solo exhibition As We Used to Float, opening September 26, 2018. The LP will premier live together with the video installation during a special presentation in Berghain the same day for Berlin Art Week.